Partnering with Operation FINALLY HOME is a way to show our support for veterans and our customers, builders, who generously offer their time and contacts to build custom homes for veterans. Wolverine, the maker of quality boots since 1883, is celebrating and supporting veterans with the launch of the Wolverine 1000 Mile Limited Edition Coyote Boot. Wolverine will donate 100% of the limited edition boot sales from now until November 14 to Operation FINALLY HOME, a non-profit organization that builds mortgage free homes for veterans. The boot will be available exclusively on wolverine.com. Wolverine will also launch Troop ID by offering veterans a discount on all future wolverine.com purchases. Operation FINALLY HOME is a national nonprofit organization that was founded in 2005 with the goal of addressing one of the most pressing needs of returning troops: a home to call their own. Their mission is to provide custom-built, mortgage-free homes to wounded, ill and injured veterans, the widows of fallen and their families, creating a solid foundation for them to move forward in their lives. Operation FINALLY HOME partners with corporate sponsors, builder associations, builders, developers, individual contributors and volunteers in local communities across the United States to accomplish their mission. 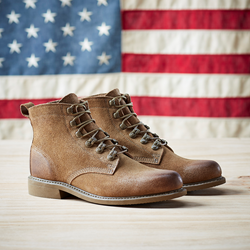 The Wolverine 1000 Mile Limited Edition Coyote Boot is handcrafted in the USA in homage to traditional military boot style and those who have served in them. Based on the Original 1000 Mile boot pattern from 1914, the limited edition boot is monochromatic from top to bottom, featuring a Vibram rubber outsole and Horween Natural Marine flesh-out leather, both in a custom coyote color. Marine boots in World War II were made with the same leather, designed to be used flesh side out and unlined because the material was soft enough that the boots could be worn without socks. This was highly advantageous for Marines in desert areas as they were able to easily empty their boots of sand, reducing blisters and increasing comfort. The boot also features Goodyear Welt construction so that the boot can be resoled and worn for years to come. Speed hooks and full coyote laces complete the look of a military inspired boot with contemporary styling. Troop ID, part of ID.me, was founded by U.S. Army combat veteran Blake Hall, driven by the goal of improving online identity verification for military personnel. The company provides digital identity cards for American military service members and veterans to allow them to establish their credentials online. Wolverine will offer discounts to veterans through the Troop ID verification process. The limited edition 1000 Mile Coyote boot is available exclusively on wolverine.com starting on November 7 at 8:00 a.m. EST. 100% of sales from this boot from now until November 14, 2017 will be donated to Operation FINALLY HOME. For more details visit wolverine.com/heritage. Since 1883, Wolverine has taken pride in crafting durable boots with unrivaled craftsmanship and the highest-quality materials. With a dedication to innovation, Wolverine provides dependable comfort and style to hardworking men and women all over the world. For those who believe in hard work and uncompromising commitment, Wolverine offers the footwear, apparel and accessories to get the job done. For more information visit http://www.wolverine.com. Operation FINALLY HOME was established in 2005 as a nonpartisan/nonprofit 501(c)(3) organization. The mission of Operation FINALLY HOME is to provide custom-built, mortgage-free homes to America’s military heroes and the widows of the fallen who have sacrificed so much to defend our freedom and values. Operation FINALLY HOME partners with corporate sponsors, builder associations, builders, developers, individual contributors, and volunteers to help America’s military heroes and their families transition to the home front by addressing one of their most pressing needs—a home to call their own. To find out more, visit OperationFinallyHome.org.